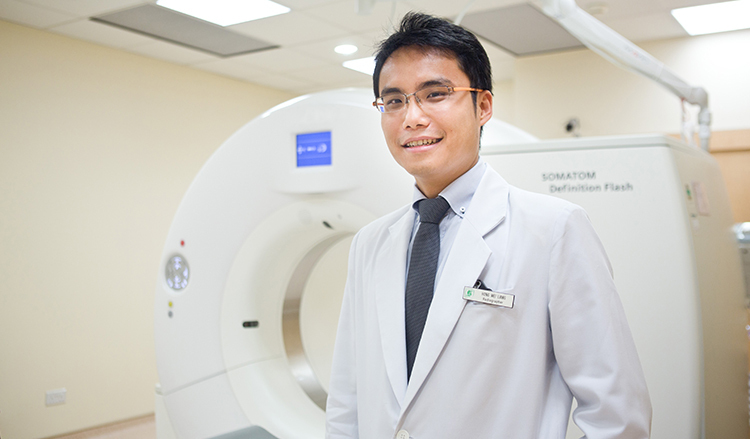 As a Diagnostic Radiographer, Hong Wei Liang specialises in carrying out Computed Tomography (CT) scans on patients who have been referred to him by their doctors. “Many people assume that Diagnostic Radiographers are exposed to considerable radiation emitted from X-rays or CT scans, thus increasing our risk of developing cancer. I too had that perception in the beginning!” Wei Liang reveals. Wei Liang pursued his Master of Science (Computed Tomography) at Ireland’s University College Dublin under the benefits of his healthcare scholarship. While he was there, he broadened his knowledge about Europe and immersed himself in the English culture without having to worry about his tuition fees. Wei Liang’s work requires him to collaborate with clinical physicians and other allied health professionals at the Singapore General Hospital to identify medical conditions and diseases. His job is crucial because he reviews scan data for any life-threatening condition such as pulmonary embolism or ascertain if a tumour is malignant with the right scan protocol.